ALBERT E. CARTER SAID IT; NASA CONFIRMED IT! The pulse was obtained by a battery-powered electrocardiographic unit taped to the subject’s body which transmitted its signals to a custom designed receiver which in turn recorded the information by electronically writing it on a chart. The oxygen consumption was measured with a K-meter that the subject carried on his back. The G-force experienced by the ankle, back and forehead of each of the university students was measured by small sensitive accelerometers which were placed in Plexiglas holders that were taped to the ankle, the small of the back, and the forehead. After a thorough medical examination, the healthy students were issued a pair of shorts and new Nike running shoes to standardize the conditions to be measured. They were given familiarization sessions on laboratory procedures, treadmill running, and trampoline jumping to ensure the exercise techniques would be the same. Each student then walked or ran four different speeds on the treadmill with a five to ten minute rest period between runs while the scientist recorded their statistics and compared them with previous treadmill studies for accuracy. A week later, these same athletes returned to bounce on a trampoline at four different heights with a five to ten minute rest period in between exercise sessions. Again the scientists recorded their statistics, only this time, they had no previous studies to compare them to since trampolining had not been previously studied. The only studies available were the preliminary studies which began in August of 1977 on passive restrained humans and animals exposed to increasing frequency and amplitude of vibration forces designed to increase heart rate and metabolic activity, “These responses measured by whole-body vibration resemble those during mild exercise and suggest that perhaps body vibration could be used in place of exercise for those who are ambulatory. The results of trampoline vs. treadmill study were startling to the scientists but quite frankly, were expected by us at the National Institute of Reboundology and Health, now named the American Institute of Reboundology, Inc. The G-force measured at the ankle was always more than twice the G-force measured at the back and fore- head while running on a treadmill. This helps to explain shin splints and knee problems, especially when the natural shock absorbing system of the body becomes so fatigued that it doesn’t do its job correctly, thus throwing added unexpected forces on already tired muscles, ligaments, and tendons, forcing them beyond the point of rupture. While jumping on a trampoline, the G-.force was almost the same at all three points, (ankle, back, forehead) and well below the rupture threshold of a normal healthy Individual. The efficient use of the vertical forces of acceleration and deceleration to produce internal loading by directly opposing the gravitational pull develops more biomechanical work with less energy expended, thus less oxygen used and less demand placed on the heart. It is Important to note that although this experiment was performed on a trampoline where the participants were able to develop a G-force as high as 8-G’s, the efficient use of energy was below 4-G’s. People involved in rebound exercise on rebound units have been measured only as high as 3.5-G’s, (United States Air Force, Dr. Ward Dean) so that any activity on a rebound unit is more efficient than treadmill running at any speed. 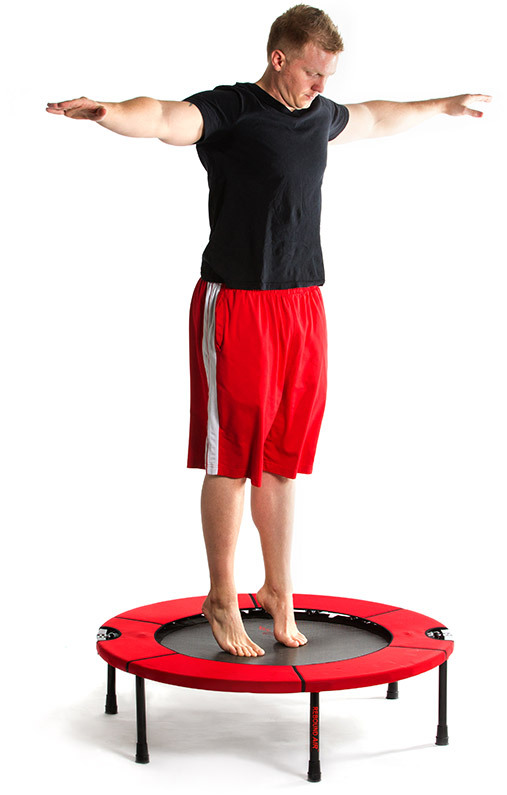 Even when a person is able to develop a force on the trampoline of more than 4- G’s, although it is no more efficient as far as oxygen consumption than running, it is still much better on the lower extremities because all of the cells of the body are still below their rupture threshold providing a safe way to exercise. This statement verifies the fact that rebound exercise is an excellent exercise for our senior citizens, those physically handicapped, those who are recuperating from an accident or injury, or anyone else who needs exercise but is hampered by a preexisting physical condition.